On 13.04.2016, Siemens and CD Cargo published a deal for the delivery of five multi system Vectron locomotives. CD Cargo tendered for new machines in August 2015. The new machines will be delivered in 2016 and will be operated in the Czech Republic, Slovakia and Germany initially. The locomotives will also be homologated for Poland, Austria, Hungary and Romania. 2017-09-20 [CZ] This is CD Cargo 383 006! [CZ] This is CD Cargo 383 006! Today in Komárom: CD Cargo 383 004 (with locomotive visuals) and 005 as seen by Norbert Tilai today. Siemens delivers CD Cargo's Vectron locomotives without stickers. This gave CD Cargo the opportunity to make something special of 383 004, the fifth and final machine under delivery. 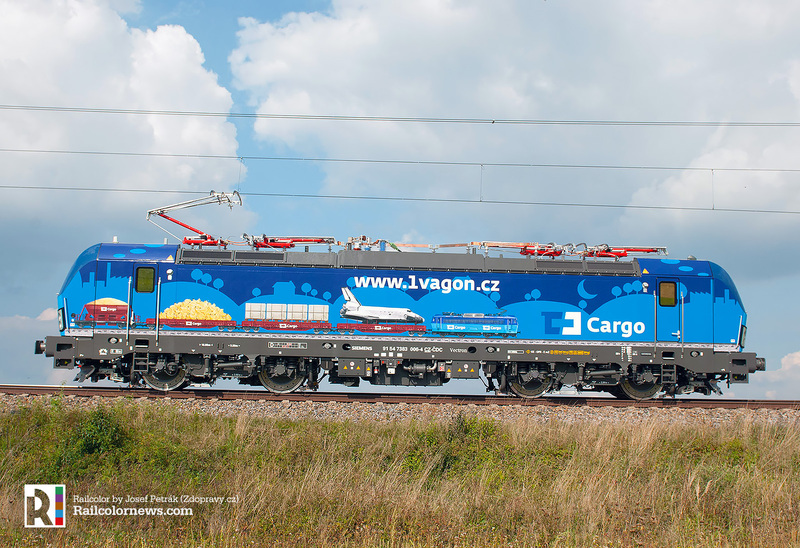 Its two-tone blue livery was enhanced by special stickers this week, commemorating the 10th anniversary of CD Cargo, and the 175th birthday of railway in the Czech Republic. First images have been published by CD Cargo. Marcus Schrödter and Dalibor Palko made pictures of CD Cargo's future 383 004 in Leipzig and Velim this week. At the test center in Velim the locomotive will get its final logos and inscriptions. The new CD Cargo 383 002 and 003 came to Hungary together. In Komárom they will absolve the obligatory tests to get homologated for this country. Thank you Norbert. Seen today in Fulda, the fourth Vectron locomotive CD Cargo that left the Siemens factory in Munich. Most likely, the 383 005 is on its way to the VUZ Velim test center soon. Like 383 002 and 003, it is transferred without logos and texts. Thanks Martin. Update: picture added made in Eisenach. This picture shows the future CD Cargo 383 001 with two vehicles of RailAdventure. Note that the locomotive has not logos/inscriptions yet. As such, the train ran to Decin. The machine continued its journey to the VUZ Velim test center in the Czech Republic, where it is now for tests. CD Cargo 383 001 is on tour. After being in Slovakia on the 18th, it was seen at Öttevény in Hungary, the next day. Both countries are part of the country specific package of the machine, and the four that are to be delivered. Thanks Ludwig GS and Norbert Tilai. CD Cargo 383 001 has started making test runs in Cerhenice, at the test ring of the VUZ Velim test centre. Remember that the locomotive is not yet approved for any country. Thank you Jiří Navrátil for the image. After visiting Kassel, CD Cargo 383 001 travelled to Bad Schandau with RailAdventure 103 222. There the machine was picked up by CD Cargo 372 014 to continue its journey in the CZech Republic. Thank you Norman Gottberg and Marcus Schrödter. Off to VUZ Velim. This morning RailAdventure 103 222 was in Munich to pick up the new CD Cargo 383 001-5. It now has the full CD Cargo livery, resembling the renders that were published when to order was announced. Next! Today Siemens and CD Cargo signed a deal for the delivery of five multi system Vectron locomotives. The contract is the result of many months of negotiation. CD Cargo tendered for new machines in August 2015. The new machines will be delivered this year. CD Cargo plans to present the first unit in blue during the Czech Raildays 2016, which takes place in Ostrava (CZ) on 14-16.06.2016. CD Cargo wants to start using the machines for car transport services in the Czech Republic, Slovakia and Germany. The locomotives will also be homologated for Poland, Austria, Hungary and Romania. This is the same package as the PKP Cargo Vectron locomotives for example.